A small N gauge layout packed with detail. As discussed on the Brockhampton layout page, N gauge is increasing in popularity. At NFMRS there are about eight of us working on Brockhampton as well as having our own N gauge home layouts. 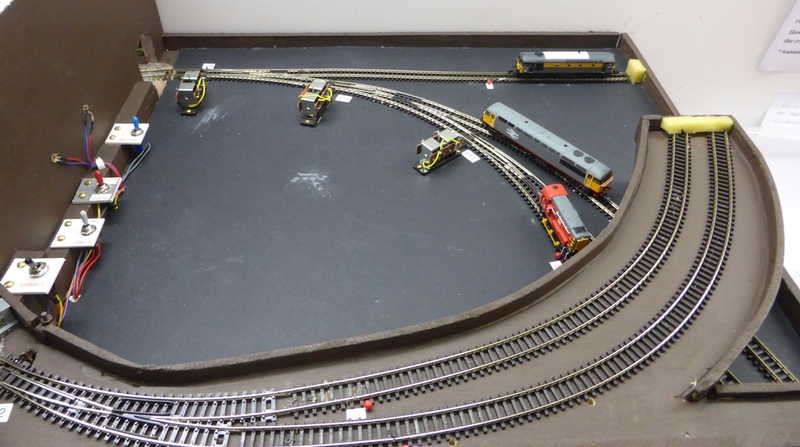 So it is good to have another N gauge layout on our website. Elmbridge MPD is a great example of how much model railway can be squeezed into a small space, and here there are TWO layouts on different levels! 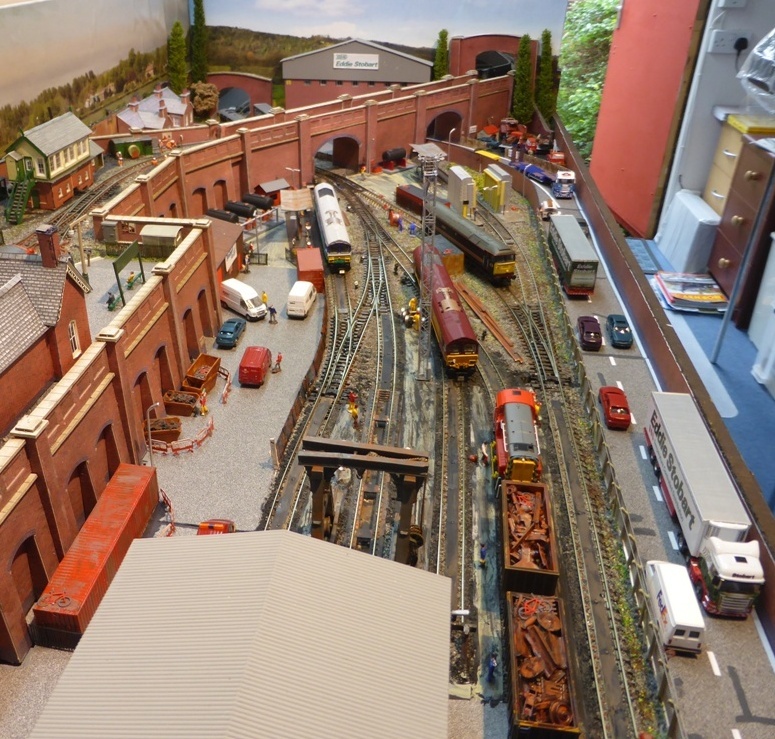 What's good about a layout of this small size is that there are still loads of operating possibilities and being only 54" x 18" it can be stored easily. If it has to be moved around it can also fit in the back of medium sized car. The upper level represents the small station of Elmbridge and here trains can run from the station over the viaduct and into the fiddle yard which we must imagine as going onward to main line services. At the station the trains would run on under the footbridge to further stations. Remember that we have to use lots if imagination as to where trains come and go to with any layouts having blind ends! The fun is in the train movements and modelling. Elmbridge station has many details, buildings and modern scene rolling stock. The walls to the raised station give a pleasing three dimensional effect to the layout. And so to the lower level - Elmbridge MPD where most of the train movements takes place. 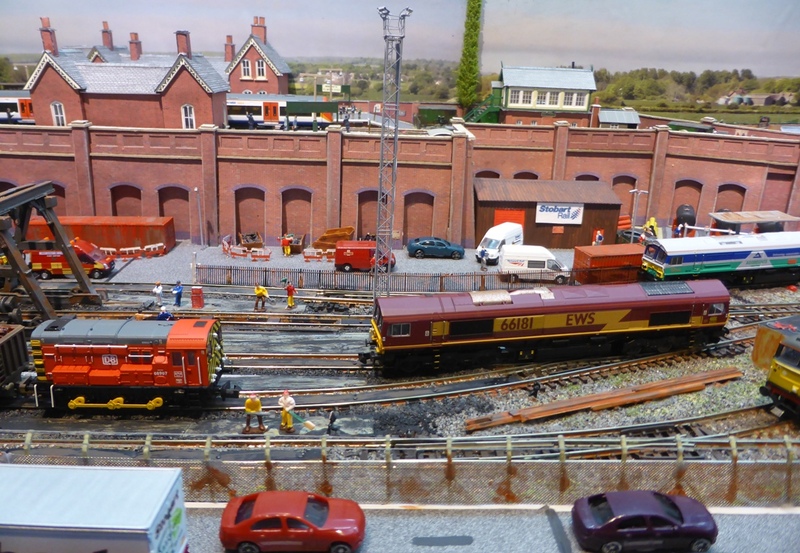 A busy road runs alongside the five sidings of the MPD with several turnouts to allow a multitude of operating possibilities. Again there's loads more detail with vehicles and figures. Note the viaduct for the trains from Elmbridge station on the upper level. A closer look at the MPD. 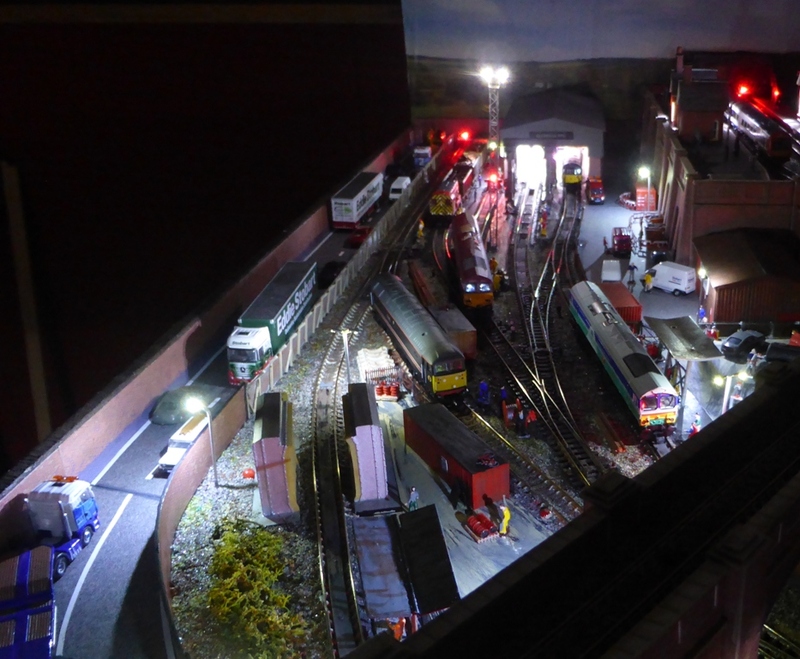 Many of us don't just admire a model railway itself but are also interested in how it all works, so this is what the Elmbridge MPD fiddle yard looks like. It is small, but this layout could almost be classed as micro layout or diorama and there's not much room available. The curved fiddle yard track provides a few more precious inches for train storage and movement, but multiple trains can still be used. There is a separate bolt-on control panel with multi pin connectors and cables to the layout. ... the extensive lighting. But we may not see this in its full glory at exhibitions because of hall lighting. Even so, during ambient light conditions this lighting system is still effective. N gauge has so many possibilities.